Over the past year I have received some surprising feedback upon telling my predecessors that I am the Lead of the Millennial Innovation Council Newsletter. Just the other day I was working on our newsletter and a few of my colleagues said “Ha, that’s hilarious, I bet you don’t even know who Prince was,” and “You probably still use your parent’s credit card.” I proceeded to ask what year they were born in, which they said was 1982. According to Wikipedia, “There are no precise dates for when the generation starts and ends, but most researchers and commentators use birth years ranging from the early 1980s to around 2000.” While my colleagues technically fall in the Millennial age range, they refuse to associate with the term. Why is it that being coined a “Millennial” has such a negative connotation when we make up almost 50% of the global workforce? While there are all sorts of studies being published about how older generations can effectively work with and adapt to millennials at their corporation, I think it is important to embrace the positive traits that we bring to an organization. Millennials have a strong desire to work overseas, and 71% of them expect to be assigned an international assignment at some point during their career. This is great news for many employers looking for global growth as well those looking to cut costs, as many countries are currently much cheaper than the U.S. Even better, over half of millennials said that they would be willing to work in a less developed country to further their career. Collaborating with inspiring colleagues is the environment that millennials thrive in, something that is fundamental to Capgemini as it directly aligns with our core tenants. We are innately collaborative and accustomed to learning in teams and by doing, which allows companies to develop stronger team structures and build their networks at a faster pace. Millennials’ knowledge of new and emerging technologies clearly sets us apart from our counterparts. One of the defining characteristics of the generation is our compatibility with the digital world. We have grown up with smartphones and social media as the norm, and in result expect instant access to information. This is the first generation to enter the workplace with a better grasp of a key business tools than their more senior workers. A particular characteristic of millennials is our ambition and desire to keep learning and move quickly upwards through an organization. This offers employers a unique opportunity to train their young counterparts for more senior roles that would otherwise be filled by more expensive resources. It is in each employers best interest to work towards understanding this generation and appeal to our needs in order to attract and retain the majority of the workforce. The rate of millennial churn is inevitable, so it is important that older generations understand our outstanding traits so that they can successfully build a millennial working model into their organization’s fundamental mission. John Story’s research focuses on various dimensions of customers’ relationships with brands and on the impact of generational cohorts on management and marketing. He has done extensive research on recruitment, retention, and the educational experiences of college students. In his industry, John has conducted research for a variety of automobile manufacturers, retailers, and service providers. His work has been published in numerous academic journals, including Journal of Business Research, Journal of Consumer Marketing, and Journal of Product and Brand Management, as well as in practitioner-focused journals, such as Marketing Management. His Short Books on Business are available on Amazon.com. Over the last month two close friends of mine have left their corporate careers to follow other, less traditional opportunities. One has joined a start-up on the other side of the globe. The other has chosen to work as a location independent freelancer, in order to focus her energies on a social cause close to her heart. These are two examples within a much broader trend that is being referred to as the future of work. There are a number of definitions floating around for the future of work. My favorite is “a blend of technology and social drivers are creating the conditions for a radical rethink of what it means to work.” I believe this affects all aspects of work from the purpose and outcomes of work, the sorts of work we do, the way we organize it, the tools we use and the locations we choose to work within. Across all of these, we will ask the questions what is changing and what does this mean for large organizations of today. In a book called The New Division of Labor, Levy and Murnane mapped a set of information processing tasks along a spectrum from simple arithmetic on one end, followed by more complicated algorithms such as predicting mortgage payback. At the other end of the spectrum were activities such as pattern recognition, communicating with natural language, and detecting sarcasm. Traditionally computers have only been strong in the first couple of activities, leaving the other end of the spectrum as the domain for humans. Self-driving cars completing complicated information processing to be able to navigate through busy junctions. With Just Eat, the food delivery service, announcing the use of autonomous delivery vehicles in London this summer, the impact of this technology is getting clearer and clearer. Machine Learning techniques are being applied to the white-collar knowledge work world of medical diagnostics and legal case identification. Cheap robotics are making humanoid robots an attractive proposition to augment staff in physical environments such as bank branches and airports. Robotics are even getting into the most humane of fields, caring for our own. Paro the robo sealis currently being tried in care homes to alleviate loneliness and depression in residents. As these trends continue they will have a profound impact on the workforce. This simple graphic from Frey & Osbourne’s The Future of Employment neatly shows how digital technologies are entering traditionally human areas of work. This is not a new phenomenon. Many times before we have seen new technologies disrupt the workplace. Schumpeter, the 20thcentury economist, coined the phrase Creative Disruption recognizing the disruptive force of new technologies along with a complimentary creative force. For example, in the early 20th century America had a large number of people employed in the piano making industry. The piano was the living room entertainment item of choice for the new American middle classes. However, as the popularity of the television grew, the number of people involved in making pianos reduced significantly to be replaced by people manufacturing the televisions and in the newly created broadcasting industry. The digitization effect is creating a new wave of Schumpeter Creative Disruption that will cause a further evolution in the jobs market. It will be interesting to see the new roles that emerge from the creative force. Christian Forsberg, Global Chief Architect, Sogeti Labs shows us a vision of the future when chatbots and humans will work together. Next The Digital Workplace—IT’s Biggest Challenge? One way to ensure that your organization is ready for the digital age is to address your organization’s culture. State-of-the-art technology alone won’t turn you into a digital master. What is organizational culture? Before starting the digital culture transformation journey, the understanding of the core culture (see Fig. 1) is crucial for success. It consists of (easily alterable) visible artifacts (e.g., office design), invisible espoused values(e.g., rules) and basic assumptions (e.g., attitudes). Espoused values and basic assumptions change over time when leveraging the right triggers. What is digital culture and how can we assess it? Eight specific dimensions define the digital viability of an organization’s DNA: Digital leadership, digital technology and processes, autonomous working conditions, agility, entrepreneurship, collaboration, innovation and learning, and customer orientation. The Digital Culture Assessment (DCA) highlights the well-developed dimensions and dimensions with a need for improvement. How to design a culture change? The journey to culture change is based on the results of the Digital Culture Assessment (DCA). A comprehensive transformation design triggers the corporate parameters and therefore, achieves a mindset change. Before we understand what digital culture is, we first need to understand corporate culture in general terms. The CEO is in charge of cultural change and must have a deep understanding of the different layers and its respective elements and meanings in order to achieve change. Many CEOs struggle with illustrating culture because there is no tangible output that an organization produces—corporate culture is just “there.” It is the company’s DNA—the way an organization “smells” and “behaves” with visible and invisible elements. Corporate culture is the host of visible manners and rituals, named artifacts, invisible espoused values and basic assumptions, by which a company differs from its environment. Culture influences decision making, behavior and the motivation of employees—thus, individual and company performance. But how to trigger change of your core culture? An organization can easily change artifacts (like an office design) but it is clear that it can’t just change espoused values or basic assumptions which were around for decades; a practical approach is needed here. In the light of experience, changing the corporate parameters triggers a shift of the core culture. Therefore, changing the corporate parameters becomes a crucial precondition for modifying the core culture. The corporate parameters comprise of vision and strategy, leadership and people, processes and organizational structure. When addressing vision and strategy the objective is to achieve a clear picture of the future culture, align it accordingly, and enable leadership to communicate the future vision and strategy. Managers need to help stakeholders understand the cultural journey by cascading a compelling change story with innovative communication formats. Enabling leadership and people to understand and adopt new behaviors is key when bringing new values to live. 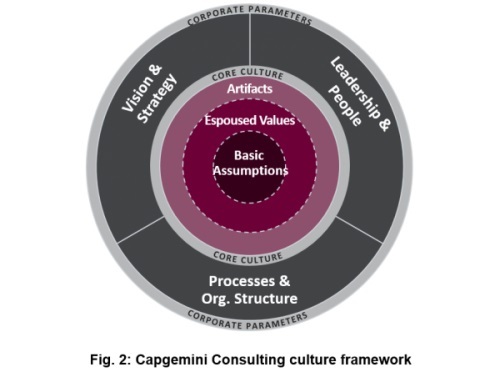 Through practical formats employees see and feel the new world—the Capgemini Applied Innovation Exchange is a suitable format to “feel the future.” Corporate culture must be anchored in the processes and organizational structure. A network of multipliers (e.g., change agents) can support the implementation of new ways of working. Organizational structures can facilitate (interdisciplinary) collaboration and prevent silo thinking. In Phase One of the culture transformation project, an assessment is performed throughout the organization to ascertain which digital dimension is strong and which dimensions require advancements. The focus lies on the latter. One of the key aspects of digital transformation is how an organization and its workforce will deal with new technology, such as machine learning, Artificial Intelligence, chatbots, and so on. With advances in computing power and data access, we can envision a future where robots will no longer be restricted to doing ‘blue-collar jobs’, but will complement our traditional organizational structures. From chatbots, to autonomous cars, and responsive and interactive mobile apps, this new “machine partner” has the potential to delight and empower us. While organizations must face this reality, they must also focus on their employees’ adoption readiness to embrace this new way of working. Read our audience insights on how organizations can plan and manage this change: Robotic Process Automation – Gearing up for greater integration. The Digital Workplace—IT’s Biggest Challenge? As if CIOs did not have enough to think about with digital business, cloud, bimodal IT and automation, the next big challenge looms on the horizon—the digital workplace. I also see the digital workplace as a foundation stone for any organization that is approaching artificial intelligence and automation as an opportunity to empower employees to create value in new ways. It puts people—and what they need to be more collaborative and creative when administrative tasks are automated—in the spotlight. At its simplest, the digital workplace is one that offers employees anytime, anywhere access to technology devices and services in a way that boosts engagement, creative thinking and agility. It’s also a melting pot of technology, culture, interior design, business strategy and more. Which is why it is possibly IT’s biggest challenge. Stakeholders are key and IT needs to work at two levels. At one customer there are more than 50 people involved in the decision-making process for their digital workplace initiative all with very different objectives. The CIO needs to find a path that balances business objectives, employee needs and security and compliance. At the other end of the spectrum, in the era of “consumerized” and user-centric IT, any successful technology implementation needs to involve the largest stakeholders: those employees using the technology. Which means getting IT out from behind their desks and into focus groups and ‘genius’-style IT service bars. Exploiting emerging technology, human capital and consumer trends requires longer term and sustained planning efforts. Yet, CIO’s spend just 3% of their planning time looking beyond five years. At some of our digital workplace initiatives we’re planning ten years into the future, while a separate development-led team focuses on delivering shorter-term projects. Digital business is forcing many organizations to eschew cultures that promote risk management and predictability in favor of risk-taking and creativity. A progressive, digital workplace can be one of the catalysts for that change, enabling employees to join up new and existing technologies, services and resources to explore new ways of working and creating value. But only if IT is as committed to experimentation and creativity as the business expects and needs all its employees to be. We need to move to a world where todays’ non-compliant application is tomorrows’ celebrated new application. Seamless workplace services and that commitment to experimentation require an underlying flexibility in infrastructure and services that only a bi-modal IT operating model can deliver. The alternative is finding out after the event that employees have built something on a siloed cloud platform. As users gain more freedom to experiment with technology and information, a connected workplace presses further on the accelerator pedal that is IT’s loss of control over devices and applications. If the organization is not already moving away from protecting infrastructure towards a more information-focused security strategy then this should be a priority, alongside investment in behavioral based detection and response tools. I am excited by the potential that the digital workplace has to increase the CIOs contribution to business outcomes. I am also intrigued to see how, alongside automation, bi-modal, and cloud, it will continue to reshape the role, culture, and behavior of the IT department. At Capgemini, we offer clients a flexible workplace through our My Workspace offering which delivers a holistic, virtual, mobile compute environment that enables secure access for users to corporate applications and data from any device, at any time, and on any network. Testimony to the work we have been doing in this space is the recent recognition by Citrix, who presented us the Trailblazer award in their first annual System Integrator Awards at the Citrix Summit 2017. Find more information at https://www.capgemini.com/infrastructure-services/my-workspace. Previous The Digital Workplace—IT’s Biggest Challenge? It seems that every day there is a new a reference to the march of the robots, or the impact for today’s primary school children whose jobs are “yet to be created.” One recent example that really brought the scale of the digital revolution home to me, was the realization that my cousin’s baby, born last Christmas, might never learn to drive as automated cars become safer and more efficient. But we face a challenge to make sure digital skills keep pace with the potential advance. A recent report from the House of Commons’ Science and Technology Committee found that 93% of technology companies say that lack of skills is hampering commercial operations. This need for skills is not just confined to the technology sector: the Government Digital Strategy suggests 90% of jobs will require the ability to interact with technology by 2020. But at the same time 47% of workers are telling us they have insufficient digital skills (European Commission). The question is this: how do we all benefit from the digital revolution? With this question in mind I participated in Business in the Community’s Responsible Business Week last month to share the stage with other companies to exchange ideas and experiences of how to address the future of work. At Capgemini we have been thinking about how we prepare for tomorrow since we started the business in 1967. There is no set route map to growing the right skills but we believe we can learn from real time experience through pockets of activity as groups of individuals adapt and seek new ways of working. We have identified three elements. First, we need a workforce that is agile and able to adapt quickly to change; we have a number of initiatives, which help to develop the mind-set to thrive in a rapidly changing environment. Second, we are addressing the need for in depth skills by specifically looking at new ways of training and evolving our people. The third element is about ensuring that we engage and inspire the workforce of the future to ensure that everyone has the basic skills required for future employment. In Capgemini’s Applied Innovation Exchange—a platform containing a global network of workspaces where teams collaborate to solve business problems using technology—the design sprint process enables teams to go from problem identification to a proof of concept solution in five days (read this blog post from one of our clients about their recent experience). In the process individuals with different backgrounds who have not worked together before adopt an agile approach, which builds confidence, creativity, communication skills and teamwork while also encouraging diversity of thought. Employees get the opportunity to spend a week in this space working alongside clients and partners who also benefit from the process. We’re also seeing a move towards self-learning across different communities in the business. We have engineers who prefer to attend conferences to exchange ideas and to stimulate innovation and then build the corresponding technical skills on open learning platforms connecting with peers across the industry to learn the latest technology stacks. Such virtual communities have wider implications for creating open minds as our people engage with peers and experts outside the organization to build the skills they need regardless of location. We are seeing a move from traditional training days to time spent with others (virtually or otherwise) to collaboratively solve problems and gain real time feedback or work in cross teams through hackathons. As an early supporter of apprenticeships in the IT sector Capgemini has had over 1,000 apprentices. There are over 360 on the program today. We will see our first cohort of degree apprentices graduate this summer. Our schemes have bought us additional benefits. We have increased the diversity of our teams. Over 40% of our junior talent is female and we offer strengths-based employment rather than demanding experience or degrees. We now see the potential to create similar schemes in partnership with clients in areas of low unemployment. Over the last six years our apprentices have been instrumental in driving a more diverse culture with their energy and ideas. The vibrant social media community allows them to share their experiences with #lifeatcapgemini and our Company Secretary has been the beneficiary of reverse mentoring changing her own communication style as a result. Working with young people and disadvantaged groups we focus on skills for the future and on taking our experiences of work into schools and disadvantaged groups. Working with partners like Apps for Good and the Careers Enterprise Company, we have worked with 15,000 students over the last three years. We’ve recently refined our long-term partnership with The Prince’s Trust to develop specific digital skills program including a five day course similar to the design sprint process described above. Of the 66 who have completed this course 28 have had a positive outcome. Our clients get engaged setting the business problems, hosting and mentoring and judging. So what can lessons can we take from these activities? The convergence of the physical and virtual world will create new opportunities for our future and we must embrace them. We see can see the power of the virtual community in terms of pushing the boundaries for our people to learn from people and experiences wherever they are. Organizations can identify and seek to support these bottom-up initiatives to speed up learning, and change mind-sets. The importance of a physical space through which teams of people can work collaboratively using the right technology to address problems and innovate. Creating a space and adopting processes which are conducive to diverse, creative thinking will help to develop these new ways of working. Organizations will need to support both approaches to build the right mind-set to meet today’s fast paced technology advancement as well as to enable and speed up training and to connect with the next generation. Over the coming months we have an opportunity to identify, amplify, and share ideas and in the exchanging of them and learn from each other. The shortage of digital skills in the current marketplace is unprecedented. It is estimated that over 4.4 million IT jobs will be created around Big Data by 2015; however, only a third of these new jobs will be filled. This skills shortage is creating a “war for digital talent.” Unlike in the past, the hunt for the best talent is no more limited to localized skills in certain departments. In this case, the talent war is manifest across the entire organization. The important questions are: What skills are most relevant for the digital age? How can organizations plug the skills gap? How are digital leaders developing digital skills?